Omega Joint Xtra™ contains omega-3 fish oil and glucosamine sulfate to promote joint health, comfort, and mobility. 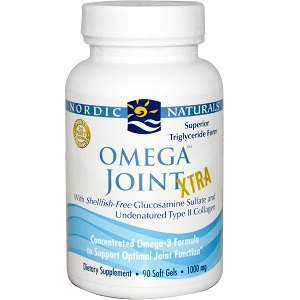 Omega Joint Xtra also contains UC-II® (undenatured Type II Collagen) to speed overall benefit. Together, these nutrients deliver high-intensity support for joint health and function. Omega-3s – 1065 mg. (includes EPA, DHA and other Omega-3s). 3 soft-gels daily with food. $51.95 for 90 soft-gels (a one month supply). Nothing is said about product guarantees or return policies in the product source. The product source does provide a contact number to call for answers to questions. This product is expensive and no information about product guarantees or returns is provided in the product source. Also no customer reviews are found in the product source. The product source does contain a list of the various awards that the product has won, however. This product is sold through a network of dealers and the product source includes a tool to use to locate dealers in different areas. Before buying this product a prospective buyer may want to visit a local dealer to learn more about the product including customer reviews and product return policies. Mark Stevens	reviewed Omega Joint Xtra	on January 22nd	 and gave it a rating of 2.5.